After breakfast at the campground, and after everything and everybody were packed back into the Land Rover, we left Tarangire and began to head North. 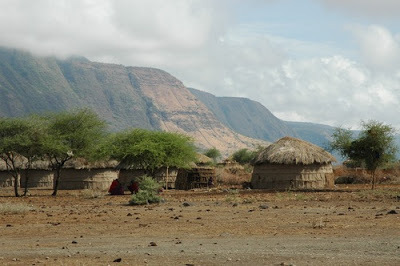 Our destination for the day was Lake Natron, located along Tanzania’s border with Kenya. The previous day, we had spent the entire afternoon driving on bumpy park roads. I hated to admit it, but it was actually nice to leave the park and return to smooth pavement for a while. I had no idea at that point that the next few days’ journey would challenge my very definition of “road.” Knowing nothing of what was to come, I relaxed as we made the easy drive to the town of Mto Wa Mbu (“Mosquito River,” in Swahili), where we picked up a few more supplies and said good-bye to Oju, who left us to catch a dala dala back to Monduli. Leaving Mto Wa Mbu, we drove for a short way on the paved highway and then turned off onto an unpaved road, strewn with gravel and stones. I remember thinking that this must be a shortcut. 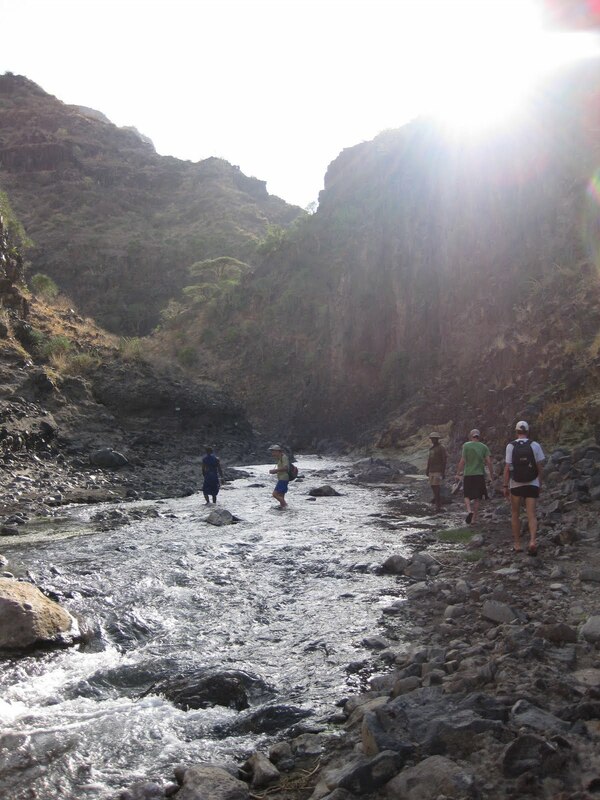 Actually, it was the main route leading to Lake Natron and beyond it the Northern entrance to the Serengeti. It was very dry, this road, and the surrounding land appeared desolate and hardly habitable. Still, we continued to see Maasai villages, and occasionally passed Maasai men, women, and children walking slowly along the road, sometimes leading small herds of bony cattle. Apart from the people, the most dramatic feature of the landscape was the East Africa Rift escarpment, a thousand-foot difference between the valley floor and the higher plain to the West that stretched to the North and South as far as we could see. The escarpment was a constant and impressive reminder of the tectonic activity happening here. I remember the drive through this dry land as having a timeless quality. It was the middle of the day, and no one said much as we bumped along through for what seemed like hours through that dry valley. After we had been driving for a while, the road began to rise and we could look out over the landscape of the Engaruka Basin. 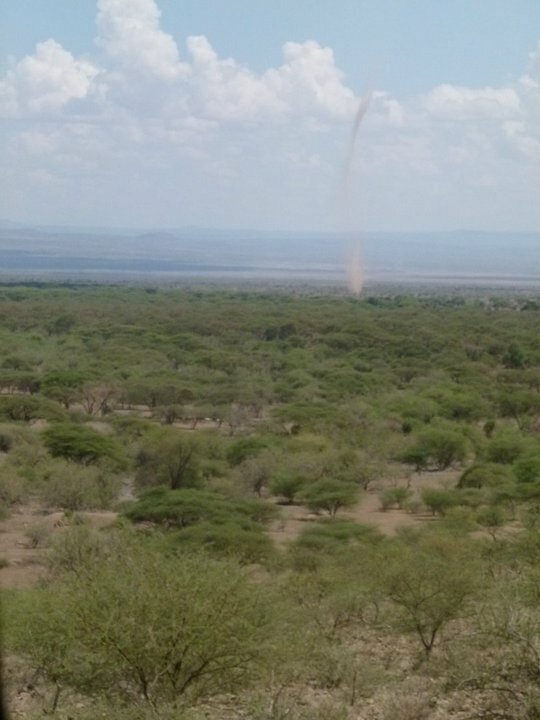 Here and there, the wind whipped up tall, slender dust devils that extended hundreds of feet in the air and presided over the basin like primitive spirits of the land. As we continued North, we had excellent views of Ol Doinyo Lengai, an active volcano and the third-tallest mountain in Tanzania. 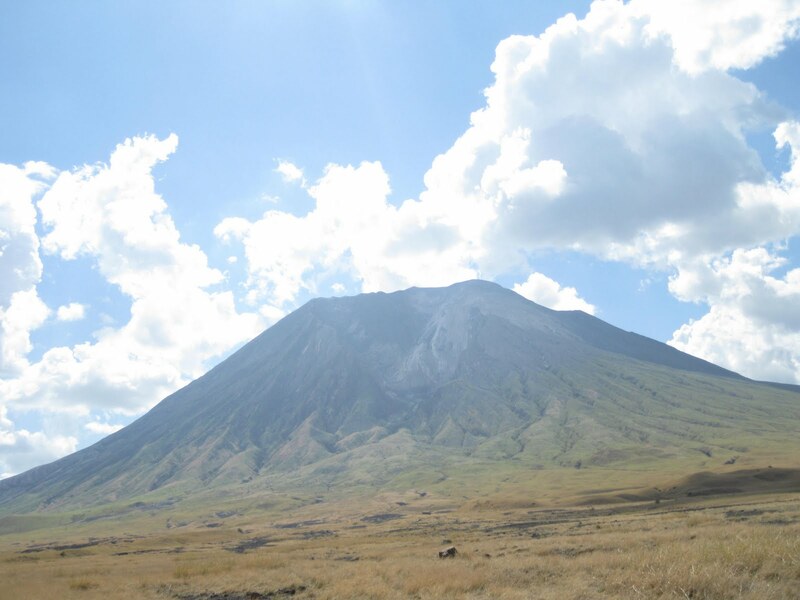 The volcano, whose name means “mountain of God” in the local Maasai language, has erupted several times in the last hundred years, most recently in 2007-2008, when it deposited new layers of lava and ash into the basin. Rob explained that the lava from Ol Doinyo is unique among active volcanoes, containing sodium and potassium carbonate that makes Lake Natron a “soda lake” and that gives the surrounding area an appearance unlike anywhere else in the world. Throughout the trip, Rob gave a lot of thought to finding spectacular spots for our stops, and this day was no different. In the early afternoon, we pulled off the road and up to the edge of a huge caldera a kilometer across with a view of Ol Doinyo looming in the distance. We must not have been the only travelers to ever stop in this place. A minute after our Land Rover pulled to a stop in the soft gravel, a band of Maasai women and girls appeared with bracelets, necklaces, and other trinkets to sell. None of us were interested in buying anything, and after a few words of Swahili were exchanged, the women left us alone and sat down in the shade of an Acacia tree. Our party sat down in the shade of another and we ate our lunch. It was impossible not to think about what we had — our bottled water, the individual boxes prepared by Henry that each contained more than any of us would eat at one sitting — and not think about our neighbors. We had no way of knowing whether food was scarce for them or not, but the option of throwing away the food was intolerable. When we were finished, Peter, our driver, took a box of untouched fruit and other items over to them, and then we left. 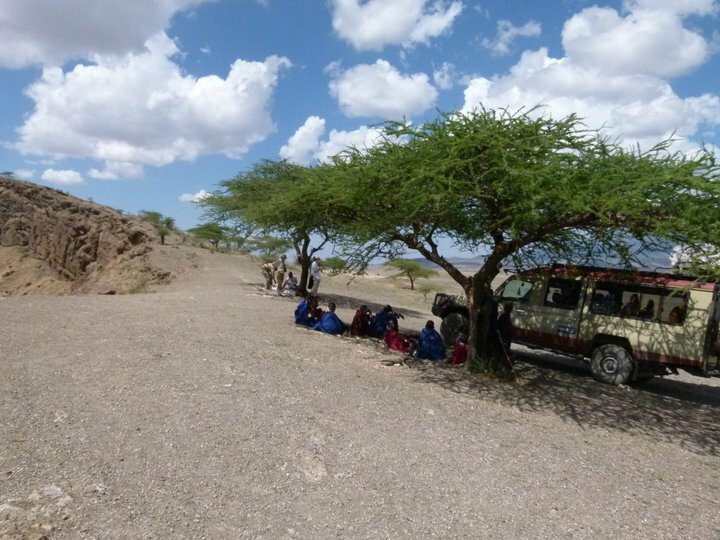 The Maasai have quietly asserted their authority by taking the best shade. It was fairly late in the afternoon, probably around 4 p.m. when we arrived at the Lake Natron tented camp. The camp was adjacent to a Maasai settlement that turned out to be the same village where Joni had stayed for a week as a student in 2004. Maybe she had mentioned this before and it had not registered with me, but it made the place feel oddly familiar, as though I had known it for a long time before arriving on this day. Unlike everything else we had seen that day, the camp was lush with green grass and a variety of trees. The reason for this was a stream that flowed out of the high hills above the camp, down to the lake. Our plan for the end of the afternoon was to follow that stream backwards, hiking through the narrow gash in the rocks where the water rushed down until we came to what Rob promised would be a waterfall and pool where we could swim. We were certainly ready to be out of the Land Rover, and the idea of swimming was very tempting. For our hike, Rob had hired a Maasai to accompany us. At first, I thought that the role of guide was an honorary position, a courtesy to the local population, but I soon changed my mind. After a short way on the trail, we began crisscrossing the stream, now stepping on submerged rocks, now plunging through the water. Our guide knew every step of the way, knew which stones were firm steps and which were treacherous. Although he was a slight man, perhaps 5’2″, he was extremely strong, as I discovered at one stream crossing. He was standing knee-deep in the torrent, patiently helping each of us cross without mishap. When it was my turn, I put my foot down in the wrong place and stumbled slightly. At once he reached out to steady me. His arm was like an iron bar. After a half hour of hiking in this way, we arrived at the waterfall, an astonishing extravagance of water in this dry place. While the older adults waded gingerly into the pool, Joni and Loren leaped in like seals and splashed about joyfully, washing away the dust of the long day’s drive. Refreshed, we walked back down the trail as the afternoon shadows grew longer, then took the short ride back to the camp. The sun was setting as we entered the camp for the second time. As we waited for dinner, we discovered that some of the camp personnel had a generator and had converted one of the tents into a “Club” with a satellite radio and a tiny refrigerator that held beer that was not actually warm. We splurged on a few bottles of “Safari” and then, as night enveloped the camp, settled down at a table with a pair of lanterns to share our evening meal. This entry was posted in Tanzania and tagged Lake Natron, Tanzania. Bookmark the permalink.